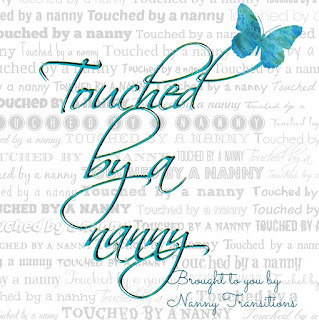 Nanny Transitions: Nanny Transitions presents "Touched by a Nanny"
If you are a nanny I don’t have to tell you that as much as our jobs are fun, they are also challenging and isolating at times. When you are going through a challenging time on your job you need someone to vent to that truly understands. We’ve all been through job challenges, and even life challenges and have experienced someone who stepped up and offered a word of advice or a listening ear that made all the difference in helping us get through. I know that for me….there are countless nannies who have made a difference in my life…. We read about the nannies who win awards, the nannies who write blogs, the nannies who serve on boards and the nannies who organize events but what about the nannies who simply do ordinary things in extraordinary ways every day of their lives. I have been mulling this project over in my mind for a while now and I decided to ask the nannies whose names you recognize to write about nannies whose names you might not recognize. It will shine a light on nannies who are quietly making a difference. If you would like to write about a nanny who touched your life……I would love to hear from you. "Donna Robinson"... aka The Traveling Nanny, on behalf I write this loving blog/note. "You go first!" and she did. As Donna spoke, with such enjoyable humor, and delivered the message so amazingly, I knew I wanted her to be my nanny friend forever. I also learned something very valuable from Donna Robinson that day... "Private Victories precedes Public Victories." This blog/note is about Donna Robinson, but it is about much more than that. As I chronicle the past 14 years,(and counting) of friendship, mentoring, guidance, advisor, cheerleader, sisterhood and buddy, she is so much more. I am especially grateful to her. A memory of light so many years ago...and today, a beaming light - beaming strong! Thank you Donna Robinson, for being one of my earth angels and guiding spirits. God sure knew what He was doing when He let us cross paths.